Make sure the Extras > Android Support Repository package is installed with the Android SDK. Execution failed for task ':app:packageAllDebugClassesForMultiDex'. > com.android.builder.testing.api.DeviceException: com.android.ddmlib.InstallException: Failed to finalize session : INSTALL_FAILED_UPDATE_INCOMPATIBLE: Package com.mattermost.react.native signatures do not match the previously installed version; ignoring! The development version of the Mattermost app cannot be installed alongside a release version. Open android/app/build.gradle and change the applicationId from "com.mattermost.react.native" to a unique string for your app. [Error] Error: Compilation of µWebSockets has failed and there is no pre-compiled binary available for your system. Please install a supported C++11 compiler and reinstall the module 'uws'. You are most likely using the wrong version of node and npm. Recommended versions are node 10.11.0 and npm 6.4.1. Launch XCode and agree to the terms first. 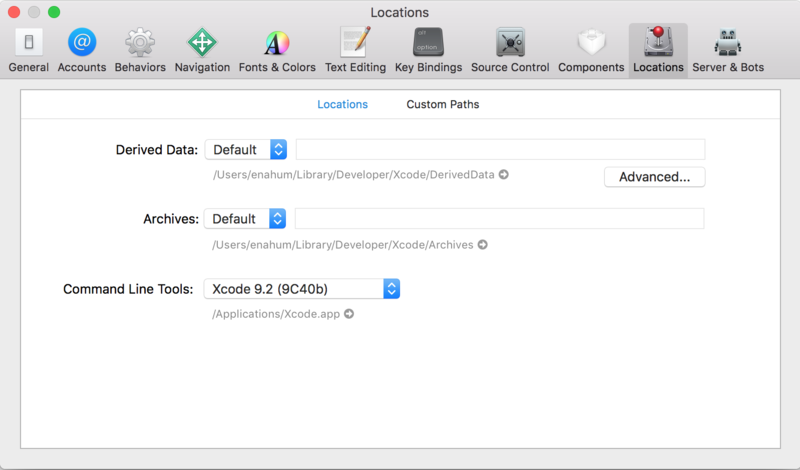 Go to Preferences -> Locations and you’ll see an option to select a version of the Command Line Tools. Click the select box and choose any version to use. After this go back to the command line and run make run-ios again. Increase max_old_space_size of the NodeJS instance.